Artist Arline Christ’s “Spirit” tries to capture symbols of friendship and a teacher’s gift—sometimes a glimpse of the “spirits” of young people as they come and go in our lives. 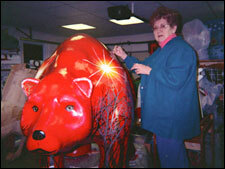 Red and black colors capture the spirit of Boyertown’s bears. 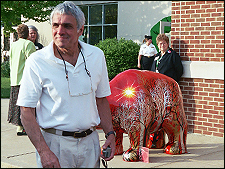 Dave Brown, sponsor of “Abe,” the Lincoln Bear, scrutinizes bears at BASH’s 2005 Arts Expo; “Spirit,” Reading Avenue’s Share Bear, and artist Arline Christ, stand “in ready” behind him, watching. 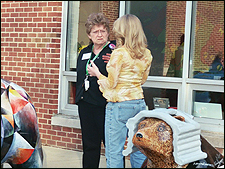 Arline Christ, artist for “Spirit,” Reading Avenue’s Share Bear, chats with Christy Pierce, student treasurer for Bear Fever, at the May 7, 2005, Arts Expo in front of “The Bear-ister, ”Barrister (Lawyer) Bear. 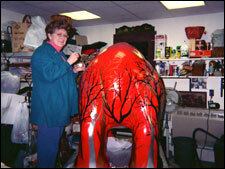 Arline is a former Boyertown Junior High West art teacher. She serves currently as the Art Director for the Carousel at Pottstown public art project. 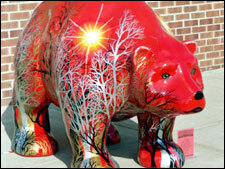 “Spirit Bear,” will feature Boyertown’s colors of red and black with images in silver and gold foil. The theme being promoted is friendship--our need to value our new friends and our old friends—the silver and gold of our lives. 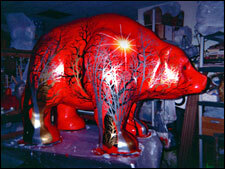 At first glimpse he is stunning red bear who commands the attention of his audience. The attractive and decorative design along his bodice grasps the interest of its viewer. As the Reading Avenue Share Bear it is not only a beautiful creation, but also holds a special meaning in the heart of its artist, Arline C. Christ. Mrs. Arline Christ is a former art teacher at Boyertown Junior High West. As a former student, I can attest to her exceptional teaching skills. She is definitely a woman who has a passion for what she does. 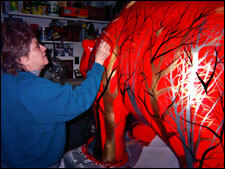 Although she no longer teaches, she is currently the Director of Art for the Pottstown Carousel Project. Mrs. Christ has participated in the Boyertown Mural and the Sister City Exchange. She has realized that there are so many things about Boyertown that are great, especially the kids. The creation of this Share Bear was sponsored by several businesses and professional offices on Reading Avenue in Boyertown. These businesses include Wren and Company; Affirmative Funding; Mario’s Pizza, Media Fusion Technologies; Boyertown Publishing Company; Gerhart, Hartman, and Ritner Insurance Agency; David Donahue, Optometrist; and Ed Furman and Keith Reitnauer of the Vision Center. I had the opportunity to speak with several of the sponsors.